SuperData Research is out with their November 2019 charts just in time to take the holidays off, and this data set has some interesting changes. 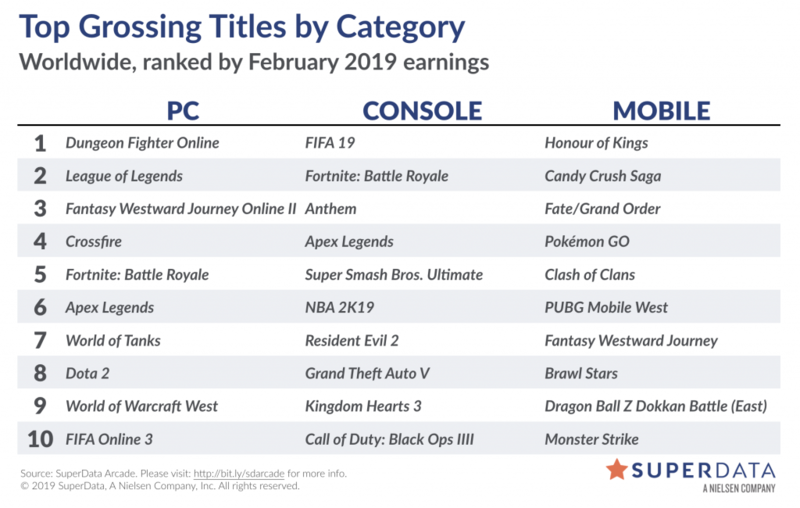 First, League of Legends, which has been having a down year, has returned to the top of the PC games list, the spot it has pretty much owned since SuperData started publishing this particular format. So the top three are back in what we might consider their normal alignment. Missing, however, is Fantasy Westward Journey Online II, which had been bouncing around between fourth and sixth place for months. But the bigger mystery is what happened to World of Warcraft? I have been posting this chart since December 2016 and WoW has been a permanent resident, even when it was split into East and West for a few random months in 2017. WoW has been as high as second place and as low as eighth, usually hanging around one notch ahead of World of Tanks most of the time, but it has never fallen off the list. Well, until now. WoW was doing well on the chart recently, rolling in the money from the Battle for Azeroth box sales and then propping up its revenues a bit with a six month subscription deal that threw in a special mount. You know all the faithful bought in on that. But now those birds are coming home to roost. The faithful won’t be spending subscription dollars again until around May 2019 while the Battle for Azeroth expansion remains a confused muddle. A pretty expansion with a set of very solid leveling zones and an actual split experience for the Alliance and Horde, seems to have fallen apart due to ill considered ideas and half measure fixes. And once you lose the rank and file, the game is stuck until it can do something new. I expect that we may end up seeing WoW Classic launch sooner than expected in order to “save” the game, or at least its revenues. If Blizz sticks to the summer launch, it will be in June. But I wouldn’t be surprised to find it moved up to May or even April now that Activision is probably on the phone every day wanting to know what the hell is going on. That big news aside, the rest of the list isn’t unexpected. Fortnite rang in at fourth, followed by the debut of Battlefield V. PlayerUnknown’s Battleground grabbed sixth while The Sims 4 came out of nowhere to hit the list at number seven. Was there a new expansion there? World of Tanks hung in at is oft repeated eighth position, sans its usual partner in WoW, while the on-again, off-again Valve pair of CS:GO and DOTA 2 took the bottom two spots once more. On the console chart, the game everybody was talking about, Red Dead Redemption 2, tops the charts. This month shows how driven by new titles the console market can be compared to the PC market, where the same old online titles linger for years. Almost everything on the console chart is a fairly recent release save for Fortnite in fourth place and the ever present Grand Theft Auto V in eighth. And then on the mobile end of the chart Pokemon Go has managed to take the top spot, beating out the usual leader Honour of Kings, pushing it into second place. And an even older title, Candy Crush Saga managed third place. And so it goes. Battlefield V and Fallout 76 launches fail to meet franchise benchmarks. We estimate Battlefield V and Fallout 76 sold 1.9 million and 1.4 million digital units, respectively, across console and PC at launch. Both are down from Battlefield 1 and Fallout 4. Ultimate Team continues to underperform. Total additional content spending in FIFA and Madden grew by 1% in November, compared to a 25% year-over-year increase last November. Destiny 2′s “Forsaken” boost was short lived. We estimate additional content revenue for Destiny 2 dropped 63% year-over-year. Overall, engagement and monetization seem to have reverted back to the same levels last seen before the launch of the “Forsaken” DLC in September. Rainbow Six shows signs of fatigue. Ubisoft’s popular FPS title has had a better-than-expected performance throughout most of 2018. However, additional content revenue declined 33% in November, the game’s biggest decline to date, and follows a decline in October as well. This points to some likely disruption from recent launches of other high-profile AAA shooters. This entry was posted in entertainment, SuperData Research, World of Tanks, World of Warcraft and tagged League of Legends, Pokemon Go on December 21, 2018 by Wilhelm Arcturus. SuperData Research released their October 2018 charts just before the US Thanksgiving Holiday. 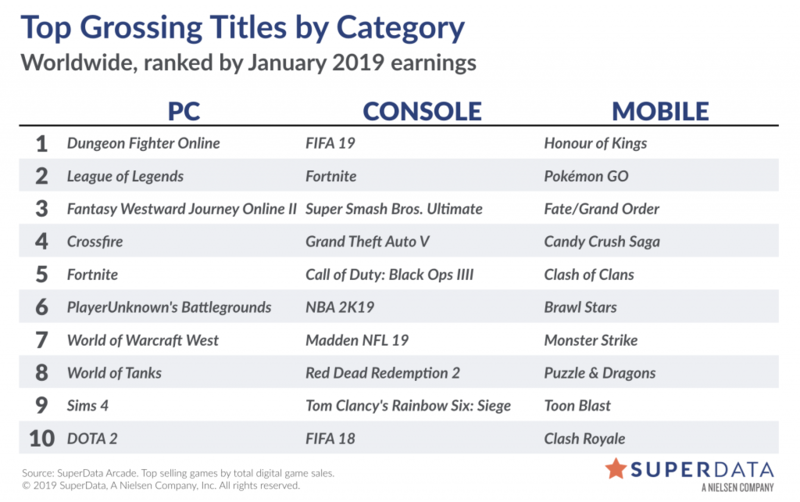 On the PC end of the chart there seems to have been a new status quo reached for the top four, with League of Legends continuing to run in second place after a long, long stretch in first. Proof, I suppose, that no game is king forever. Fortnite popped up to fifth place in October, ahead of the new Call of Duty: Black Ops III. That left World of Warcraft down in seventh, where it tends to live when there isn’t an expansion to sell. You may doubt WoW, but being able to hang in seventh with nothing new to sell it still a decent trick. The rest of the list is rounded out by PUBG, World of Tanks, and another new title, Assassin’s Creed Odyssey. On the console chart Call of Duty: Black Ops III grabbed the top spot for October, ahead of the much talked about Red Dead Redemption 2. 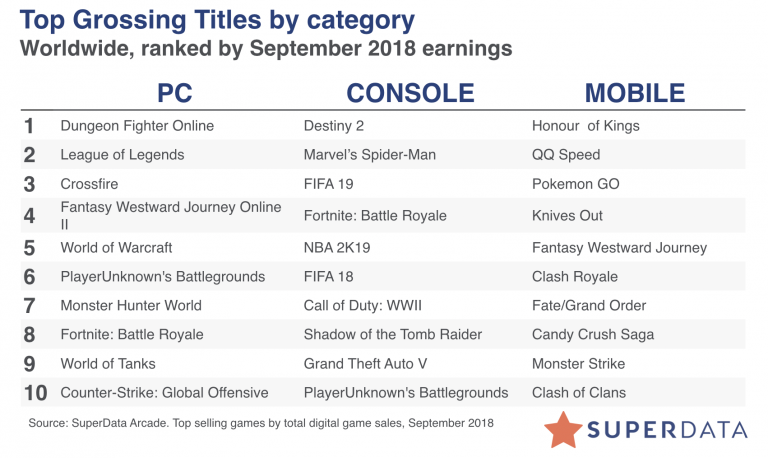 Fortnite stayed in the top half of the chart, grabbing third spot while FIFA 19, new to the September chart dropped back to fourth. Assassin’s Creed Odyssey debuted at fifth spot, while NBA 2K19 sank to sixth and Marvel’s Spider-Man, the number two in September, dropped to seventh. Then, proving that two titles from the same franchise can hold spots on the chart, FIFA 18 and Call of Duty: WWII held on in eight and ninth while Forza Horizon 4 grabbed tenth. The number one title from September, Destiny 2, fell completely off the list for October. Also gone missing was Grand Theft Auto V. The 2013 title had been holding strong on the list for ages, occasionally taking the top spot. 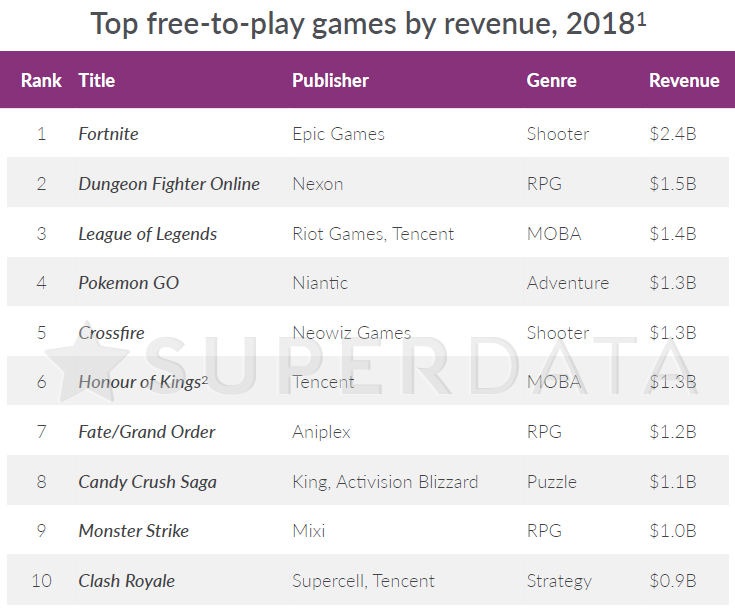 At the mobile end Honour Kings maintained its hold on the top spot, but Pokemon Go showed its strength as made it into second position, up one slot from last month, getting ahead of QQ Speed. Likewise, Candy Crush Saga didn’t just hold on but moved from eighth to fourth spot in October. 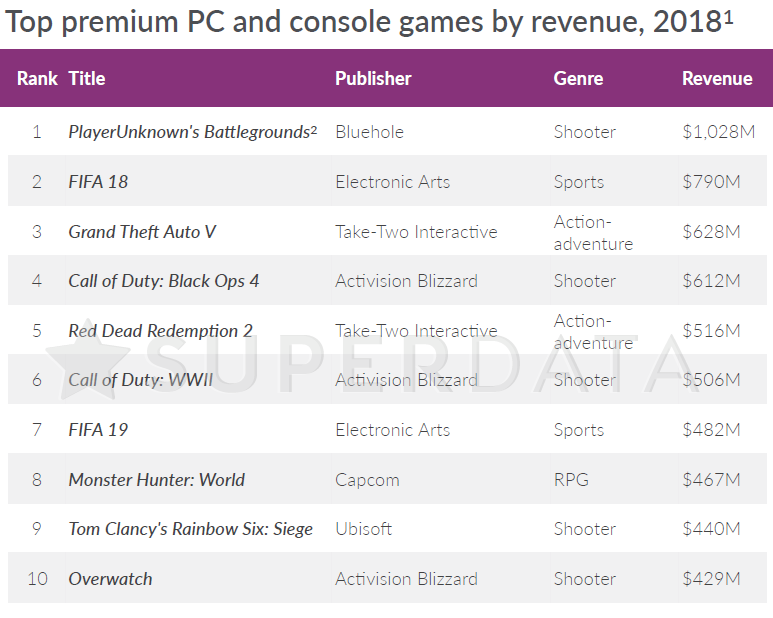 Call of Duty: Black Ops IIII sets a new high mark for console digital units. We estimate Black Ops IIII sold an estimated 4.2 million units in October on consoles, a new single month record for digital console sales. PC sales also grew significantly year-over-year, but still represent a small minority of the user base. Grand Theft Auto V begins the holiday quarter on a low note. GTA V Online revenue in October showed a double digit decline both month-over-month and year-over-year. This marks the lowest earning month for GTA V in over two years and points to a tough road ahead as Red Dead Redemption 2 ramps up. Red Dead Redemption 2 sells 4 million digital units in less than a week. Roughly 67% of the units were purchased on PS4. Based on initial sell-through, we expect RDR2 to have the strongest ever quarter of digital console sales. Overwatch’s disappointing run continues. Overwatch microtransaction revenue in October was up from September due to the Halloween update but down 20% from last year. This now makes it five consecutive months of year-over-year declines for Overwatch, which had previously shown consistent growth since launch. Fortnite rebounds but loses top console spot to AAA releases. 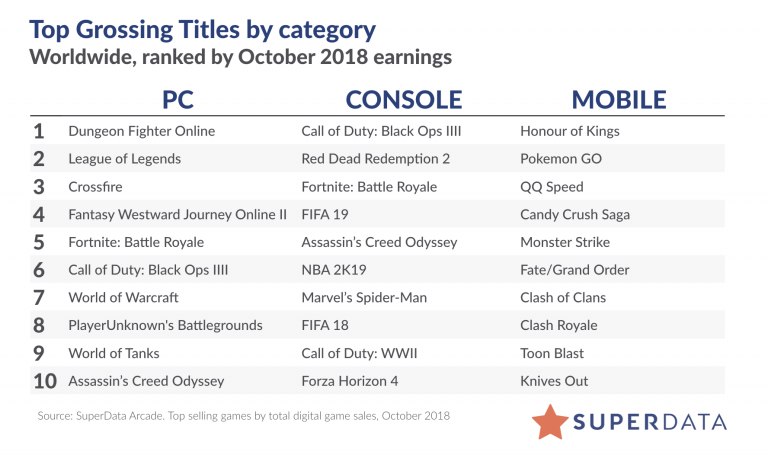 Fortnite revenue was up sequentially, and more than 20x what it made last October. This follows back-to-back months of sequential declines, although Fortnite is still off from its peak in July. This entry was posted in entertainment, SuperData Research, World of Warcraft and tagged League of Legends, Pokemon Go on November 27, 2018 by Wilhelm Arcturus. Here in the last days of October SuperData Research finally has their September sales chart out for us. I was a bit worried after they were acquired by Nielsen that they might stop feeding us this ranking regularly. Now if I could just get CCP to give us the September MER as well. Last month saw the Battle for Azeroth surge for World of Warcraft, which jumped it up to second place on the PC end of the chart, putting it ahead of League of Legends for the first time in the history of this monthly report. However that head of steam didn’t seem to last, even with Blizz offering a special mount if you would just commit to a six month subscription. WoW dropped to fifth position, though that still put it a bit ahead of its perennial seventh place slot, so maybe some people jumped on the mount bandwagon. Of course, if they paid for six months in September then they won’t have paid anything in October, so we’ll see if WoW drops more next month. WoW’s loss was LoL’s gain though, as Riot’s game moved up into second place as the constant top four on the chart were locked in together again, having also pushed Monster Hunter: World down from fourth to seventh spot. 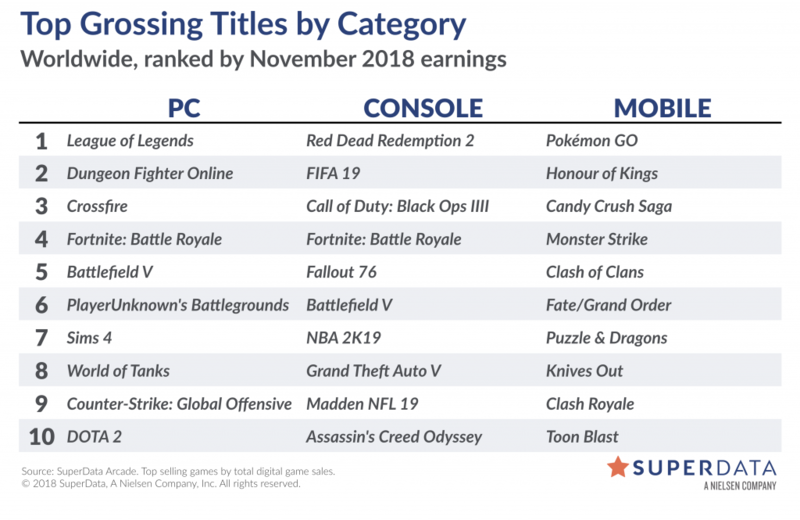 PlayerUnknown’s Battlegrounds grabbed sixth position ahead of the so-popular-the-NHL-banned-it Fortnite, which came in at eighth. Rounding out the list are a couple of the usual suspects from the bottom of the list, World of Tanks in ninth and CS:GO in tenth. Hearthstone, which made the list last month, fell off for September. In the middle, the console chart has Destiny 2 at the top, most likely due to the release of the Forsaken DLC last month. Marvel’s Spider-Man, a new release, captured second place, while FIFA 19 came in at third place. 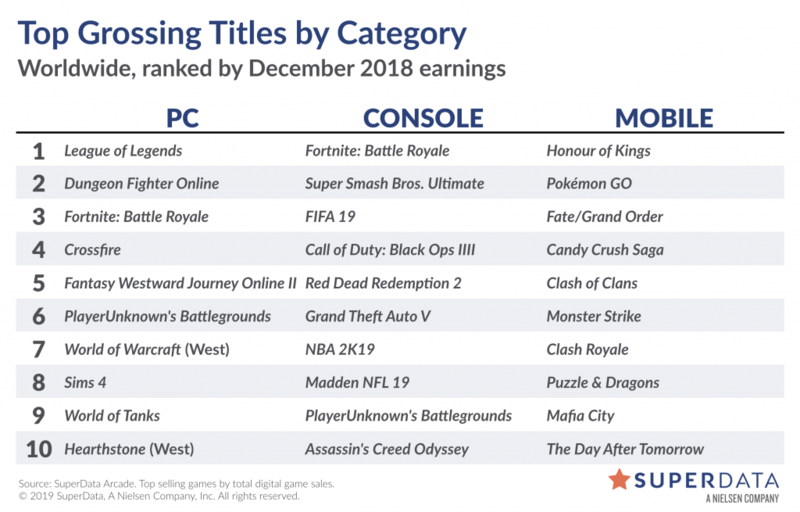 Fornite, last month’s top entry, sank to fourth place in the face of this new content, with NBA 2K19, another new release, close behind in fifth. FIFA 18, apparently not completely sapped by the release of its successor, stayed on the list in sixth position. Call of Duty: WWII fell to seventh, but stayed ahead of the fresh Shadows of the Tomb Raider in eighth. 2013’s Grand Theft Auto V, which has stayed on the list, and even topped it at times despite its age, stayed alive in ninth place while PlayerUnknown’s Battlegrounds showed back up in tenth. Among the titles pushed out of the way was Blizzard’s Overwatch. Then on the mobile end of the chart, there was only a minor re-arrangement of last month’s titles, with Pokemon Go holding onto third position and Candy Crush Saga moving from tenth to seventh spot. FIFA 19 scores best digital launch in franchise history. We estimate FIFA 19 digital console units grew 18% compared to FIFA 18 last year. Sales for the digital launch of FIFA hit another record, although the series continues to lag other AAA franchises in terms of download rates. Destiny 2 gets a big boost from Forsaken. Destiny 2 topped our digital console rankings this month on the back of the new Forsaken expansion and an increase in deluxe edition purchases. Over 60% of all monthly active users purchased the expansion. Marvel’s Spider-Man is Sony’s biggest launch to-date. Spider-Man sold 2.17 million digital units on PS4 in September, excluding download codes bundled with console sales, just edging out God of War‘s launch earlier this year. NBA 2K19 marks a new franchise peak – but with a caveat. While NBA 2K19 digital console unit sales were up year-over-year from NBA 2K18, growth fell short of the rate seen in the past couple of years.It should be noted that this year’s iteration of the game launched earlier in the month. This entry was posted in entertainment, SuperData Research, World of Warcraft and tagged Fortnite, League of Legends, PlayerUnknowns Battleground on October 29, 2018 by Wilhelm Arcturus.